Dr. Marwan Jumean graduated with honors from the University of Jordan School of Medicine in Amman. He completed his residency in internal medicine followed by his fellowship training in cardiovascular disease, advanced heart failure and transplantation, as well as interventional cardiology at Tufts Medical Center in Boston, Massachusetts. Board certified in internal medicine, cardiovascular diseases, advanced heart failure and transplantation, and interventional cardiology, Dr. Jumean has practiced medicine since 2006. His clinical interests include interventional cardiology, high-risk angioplasty, structural heart disease interventions, the use of percutaneous mechanical assist devices in management of shock and acute heart failure, and advanced heart failure and ventricular-assist-device therapy. Dr. Jumean’s patient philosophy is that the best interest of the patient is the only interest to be considered. He treats adults of all ages and speaks Arabic. 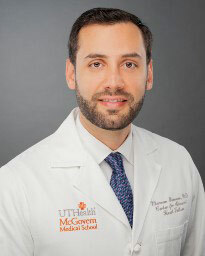 An assistant professor in the department of Advanced Heart Failure at McGovern Medical School at UTHealth in Houston, Dr. Jumean has published several medical papers and book chapters. He is currently the director of the interventional heart failure fellowship and is involved in several clinical trials involving device therapy in heart failure patients. Dr. Marwan Jumean and Dr. Sukhdeep Basra share the advancements and treatments that Memorial Hermann Heart & Vascular Institute has to offer for open heart surgery.